This is one tough pocket knife. 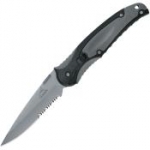 This has a very strong lockback design and a great blade design. 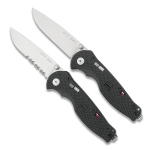 The handle is not as ergonomic as the Cold Steel Recon 1, but they aren't bad. The thumb plate that is used to deploy the blade is not for me. I prefer thumb studs. The AK-47 is one of the biggest, strongest, edc knives I know, but there are more ergonomic slimmer blades on the market for the price. Incredible value. Many people say its a hefty fixed blade weighing in at 5.5 ounces but I think its quite light. I also don't mind using a large folder for EDC and/or self defense. Quite a tactical build, absolutely no play in the blade and one wicked sharp edge. I only put build quality because the g10 under the clip makes it hard to draw quickly from my pocket because it catches my jeans a bit, but I am quickly getting used to this. Overall, great knife. 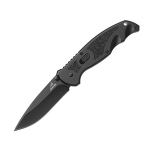 (new model)Awesome knife for the monney, razor sharp ,nice grip, good pocket clip, relatively light weight, this knife will not let you down!! highly recomended!! 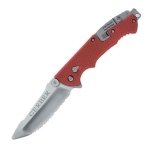 This is an awsome knife, I have used it for hunting and just everyday use. The handle feeles great in your hand and G-10 handle gives you a slip free grip. The blade will not dull quickley, however they could of made the blade just a little bit longer. The handle looks almost to big for the knife compared to the blade, but thats no big problem. My favorite part about the knife is the pocket catcher, as you pull the knife out of your pocket the thumb stud catches the lip on your pocket and opens the blade for you. It works every time.